On TV recently, I see so many shows on fixing up your home, and then perhaps selling it. My favorite right now is called Holmes on Homes. 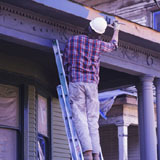 There are lots of rennovation shows, where they fix ugly houses into something nice. The world around you is a reflection of you and your own thoughts. If your environment is looking run down, untidy and in need of work, it is a clue to your current internal state. The good thing is that this connection works both ways. For example, as you clean up clutter and issues in the world around you, you gain more feelings of peace and calm. As you improve one, the other is also improved. A poorly kept house could indicate a low self-esteem, from thoughts that you don't deserve better. It is all subconscious, so you don't even realize it. Not only that, but as you see your home, it reinforces the beliefs you have about yourself, further strengthening your position. When you finally make a decision to improve your surroundings, you have to overcome all sorts of negative feelings. If you try to do too much at once, you might encounter so much inertia, that you abandon your project before you see any benefits. So best to start with something small and work your way up to something more significant. I don't have the tools. As I said above the key is to start small and work up to it. You could just do a little cleaning for example. Then perhaps get a can of paint and a brush and paint a closet or even a piece of furniture. Each successive improvement you can make will be a visible reminder that you can do things, and that you can make a difference. You will see the excuses for what they are, just excuses. You will gain confidence in your abilities as you look at things you have completed and say to yourself "I did that!" 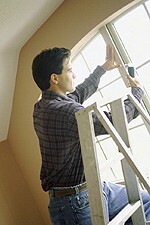 On TV there are a lot of interesting shows where people make changes and rennovations to their homes. Get into the habit of watching them and seeing ordinary people like yourself making progress. It will help you see that you can do it too. There are courses out there. For example Home Depot has free courses, in the hope that you will purchase materials and tools there. Take courses, read books and learn skills you need. Much of it is not too hard to learn. If there is something you don't feel comfortable with doing yourself, you can bring in qualified and skilled tradespeople to do that part of your project. For example, I can replace a light fitting, but I would bring someone in to do anything to do with gas. The key thing is, I can do anything - I might use others to help me do it, but there is nothing I cannot do. Good luck in your project. Let me know how it works out.